The 2019 AlumKnights Bowling for Scholarships Fundraiser was held Sunday, March 3, 2019 at Skidmore’s Holiday Bowl. Participants had a great time! Special thanks to Steve Erickson, the AlumKnights Board of Directors and the Del Norte AF JROTC for making this happen! 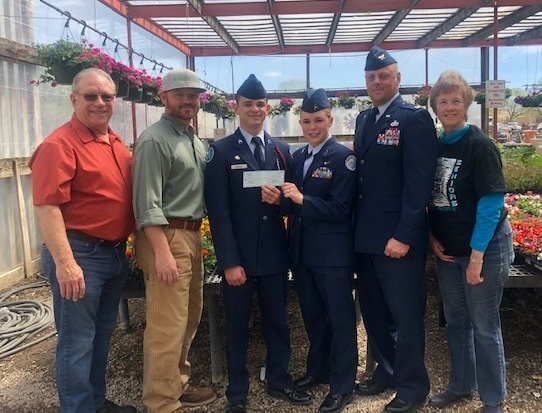 Del Norte Jr. Air Force ROTC students received a $900 check which was the result of the first annual “Bowl for Del Norte HS” fundraiser March 3, 2019. Some 15 students joined 40 plus Del Norte HS alumni and friends for the event. Adults were most impressed by the courteous and respectful students who represented the Del Norte HS Jr. Air Force ROTC program. Plant World was the title sponsor of the event. All Del Norte alumni, students, family members, faculty and staff may join the Plant World club at no cost and receive discounts on Plant World landscape materials. Janet Saiers, President, DNHS AlumKnights, Inc.